None of the students who painted dugongs and salmon on Roebuck Primary School’s footpaths today got in trouble. On the contrary, they have their photos in the paper, because the turquoise logo they painted on paths next to the school’s drains has an important community message – Keep Our Bay Clean. 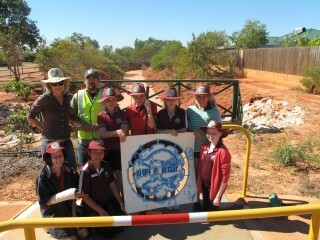 With Roebuck Bay experiencing worsening algal blooms of Lyngbya most years since 2005, the school has got into a Keep Our Bay Clean project being run by Roebuck Bay Working Group and Yawuru Rangers. The key message for Broome is that if our community can reduce nutrients and pindan from entering Broome’s stormwater drains, we have a good chance of stopping destructive algal blooms in Roebuck Bay. Roebuck Bay Working Group member Chris Hassell, an enthusiastic researcher for the Global Flyway Network, is currently in China to find shorebirds that began their annual migration from Roebuck Bay in April and May this year. Global Flyway Network researchers spend two months in Bohai Bay each spring to monitor the Red Knot and other species using the mudflats on their annual migration from Roebuck Bay to Alaska and Siberia. 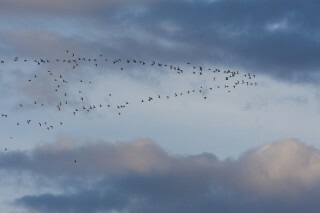 Migratory shorebirds from Roebuck Bay fly up to 10,000km each year from Roebuck Bay to Arctic breeding grounds, however they cannot do this long flight in one long haul. The need to stopover at the Yellow Sea bordering China and Korea to feed before heading to Alaska or Siberia to mate and nest. There are however serious difficulties for many of these migrating shorebirds, as very large areas of intertidal mudflats in the Yellow Sea are being industrialised at an ever increasing rate, taking away their vital feeding grounds. This means they are not able to stop and get the food they need to make their journey as successfully as they have done in the past and even in some cases to survive the journey at all. The result is major reductions in many species, particularly the Great Knot and Red Knot, the Curlew Sandpiper and several other species. To learn more about Roebuck Bay’s migratory shorebirds, their migration to the northern hemisphere and the difficulties they are currently facing getting food on the Yellow Sea, you can purchase the wonderful book Invisible Connections. The book’s editor Ms Jan Lewis said some birds faced extinction if their feeding grounds continued to be destroyed. The book contains 240 superb photos by renowned wildlife photographer Jan van de Kam. The book Invisible Connections is available from Broome Bird Observatory and the Kimberley Bookshop.